That’s why the LG xoxo is appealing to her and this device seems to be some sort of clamshell, that can separate into two units. One of them is the keyboard and one of them is the display, both of them interacting via wireless connections. 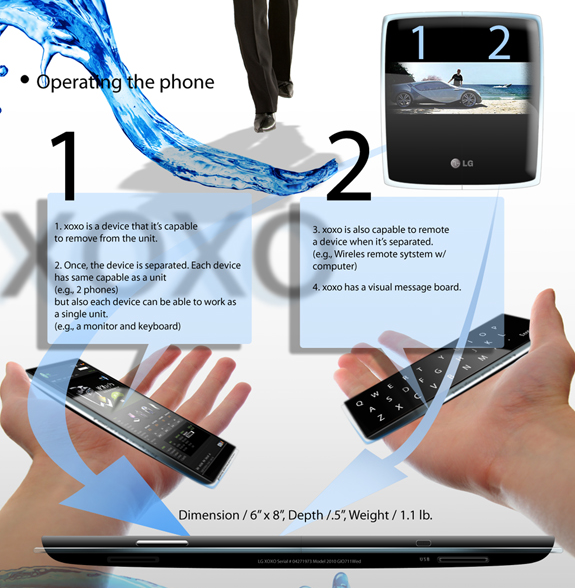 The whole LG xoxo measures 0.5 inches in thickness and weighs 1.1 lb. The interface on this LG concept phone seems to be very original and appealing and the keyboard looks comfortable. Apparently you can also plug in one of these handsets to the server managing all the information the user needs. To me this looks like a square touchscreen phone, a unique format that has failed to catch on over the past years. It’s really nice that you can separate this smartphone into two parts, with one being the remote keyboard and the other the touchscreen. I wonder how much distance can be put between two parts of the LG xoxo device… Would a young lady really have an use for this unit? Let’s imagine some specs now: 4.7 inch touchscreen, 720p resolution, 2GHz dual core phone, 8MP camera, 32GB of memory.